Nestled among towering pines and the shimmering sea on California's Central Coast, Cambria California is a picturesque village that unfolds along scenic Highway 1 between San Francisco and Los Angeles. The primary economic activity of Cambria is tourism. Located on the Pacific Ocean the area has dramatic rocky cliffs and beaches. There are many hotels and bed & breakfasts, especially along Moonstone Beach Drive. Cambria is home to the Cambria Historical Museum in the historic East Village and California State Historical Landmark No 939: Nitt Witt Ridge. Hearst Castle is located approximately six miles north whilst the Northern Elephant Seal rookery at Piedras Blancas is fifteen miles north. 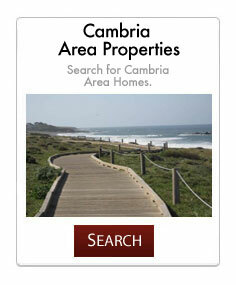 Cambria offers a variety of recreational activities such bicycling, dog walking or hiking. Local beaches offer a venue to boogie board, surf, skimboard or relax. Ocean fishing is conducted off area beaches. Local kayak fishing tours are available. Vacation homes are available all year round to get a flavor of the Cambrian life style.